Want to type messages using your voice on windows? yes you can do that easily and without the need of any third party tool. Starting with windows vista, all later windows operating systems come with a built in speech recognition tool. The tool can be usually accessed under programs > accessories > Ease of access folder in the start menu.Primarily, the voice recognition tool on windows is meant for controlling your computer with the help of voice commands. However you can also use it as a speech dictation tool which can convert your speech into text. For those who want to type messages and text with the help of the speech recognition tool, the following instructions will guide your through the process. Step 1: Navigate to Programs > Accessories > Ease of access folder from the window start menu and click on Windows speech recognition tool. If you are using windows 8, simply press Windows key + X button and select search. Now type in “Speech recognition tool” and you click on the speech recognition tool in the search results to run it. Step 2: If you are using the Speech recognition tool for the first time, you will have to set it up. Setting up the speech recognition tool is pretty much easy, Simply follow the instructions provided. 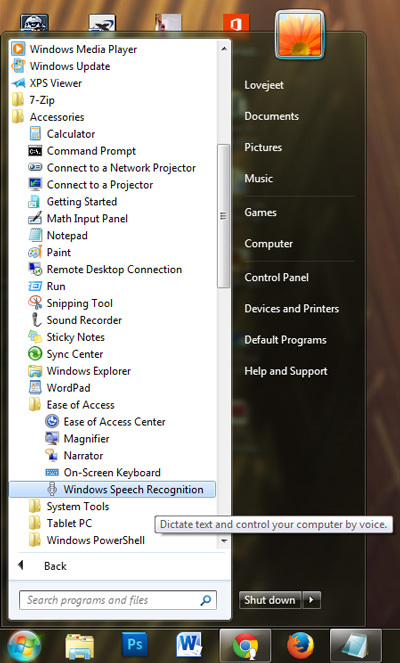 Step 3: When the Speech recognition tool is set, a floating voice recognition widget will appear on the windows desktop. Step 4: Open any text editor such as notepad. 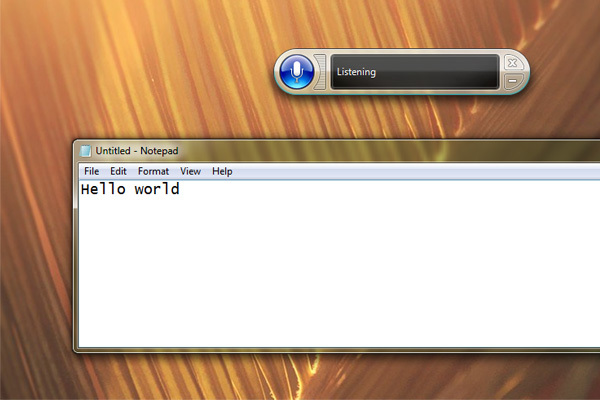 Click anywhere on the notepad and then click on the microphone icon on the voice recognition widget. Step 5: Now speak anything which you want to be converted into text. As you keep on speaking, the voice recognition tool will simultaneously convert the voice into text. That’s it, speak out anything you want and the voice dictation feature in the windows voice recognition tool will convert it into text. I have tried the voice recognition tool and I found out that it is a great tool for converting speech into text. However this tool is not meant for people with an accent. Unlike Google’s voice dictation tool found on android phones which can easily recognize and translate any English accent into text, the windows voice dictation tool on the other hand is not capable of that. As for the punctuation you will also have to speak them out.